* Rume kicks off with a strong burst of resin (myrrh) and booze. It feels thick and syrupy, yet isn’t overwhelming. * The scent is inspired by an “explorer’s hideaway” – I get that, but would add to that ‘after the holidays.’ Maybe Rume is a play on room and rune (ancient alphabet with magical significance). And yes, I did play a few role playing games in middle school. * The resins stay in focus and are joined by what I would call a mix of nutella and root beer. Nutella is a hazelnut spread which tastes like chocolate – which perfectly describes the scent. * Rume may sound really sweet, like something for children’s candy, but it isn’t – there is something robust and manly, kind of like guy who smoke pipes and eat dark chocolate. * It’s not completely linear, but once you get past the top notes, the heart notes last… and last. It softens but sticks around for more than 18 hours on my skin. 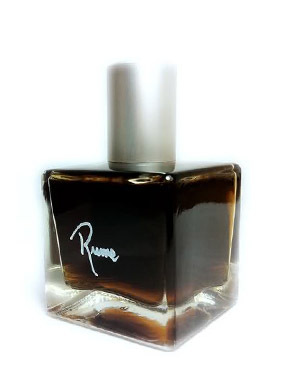 Summary: Rume is strong, dark, deep, intense and resinous – all thngs that I like in a fragrance. I wouldn’t spray it on and walk into an office, but if you can spray it on two hours before going to work, you’ll be fine. For a Saturday night on the town, this is a great one as the next morning, the base would be amazing to cuddle with. Rume is available from the Slumberhouse website and from indiescents.com. I think you did a great job describing this not-so-easy to describe fragrance. This line deserves more love!